Note: In addition to what may or may not be shown below, issues may be available for this date which have yet to be listed on our website. Due to the size of our inventory, it is possible we still may have what you are looking for. Please call (570-326-1045) or send your request to . 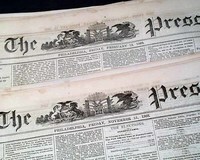 THE PRESS, Philadelphia, 1868-1869 A lot of thirty issues of this nice daily newspaper from Philly filled with various news of the day. 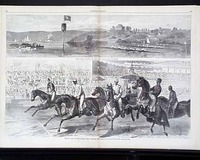 Each complete in 8 pages, generally very nice condition but a few might be a bit 2nd rate with some stains and/or tears, or partially loose at the spine. 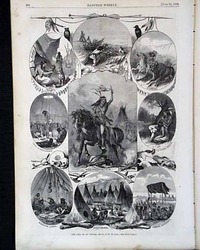 A nice lot with a wealth of content from shortly after the Civil War. 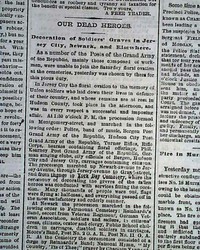 THE NEW YORK TIMES, June 1, 1868 Page 5 has, under the heading "Our Dead Heroes," multiple, day 2 reports regarding the 1st official Memorial Day celebrations from throughout the country. Locations include Jersey City, Newark, Nashville, Providence, Hartford, Portland, St. Louis, Dayton, and more. Nice to have these early reports. Other news of the day is found throughout. 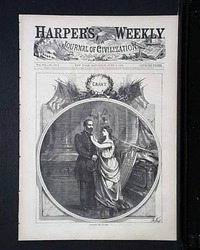 HARPER'S NEW MONTHLY MAGAZINE, New York, June, 1868. 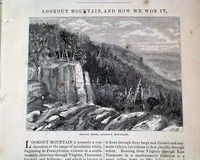 Featured in this issue are interesting prints of various areas of Lookout Mountain (in and around Chattanooga, Tennessee), which was the location of an important Civil War battle. 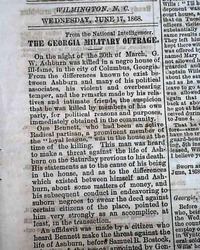 NEW-YORK TRIBUNE, June 2, 1868 Ftpg. has: "Grant And Colfax" "The Letters Of Acceptance". 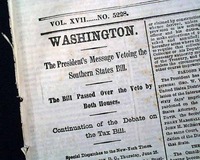 Includes Grant's letter accepting the nomination which is signed in type: U. S. Grant, as well as a letter of acceptance signed in type by Schuyler Colfax. Excellent condition. 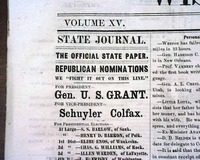 WISCONSIN STATE JOURNAL, Madison, June 6, 1868 The front page has a nice endorsement for the Grant-Colfax ticket (see inset). 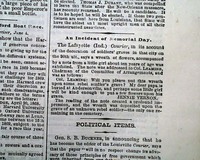 Features a famous quote from Grant ("Fight It Out On The Line") as well as a list of the electors. Uncommon to have a presidential endorsement on the front page. Very good condition. 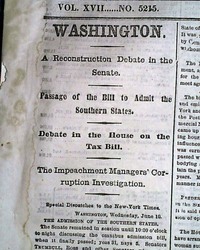 THE NEW YORK TIMES, June 11, 1868 Much of the front page is taken up with the discussion and vote regarding the re-admission to The Union of several southern states: North Carolina, South Carolina, Georgia, Alabama and Louisiana - which passed. Quite historic. 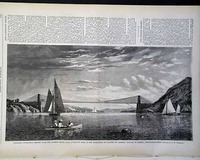 Other news of the day related to post-war activities, reconstruction and impeachment being among them, is found throughout. 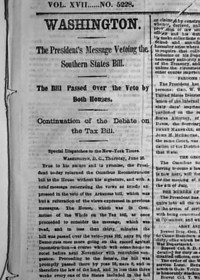 NEW-YORK TIMES, June 26, 1868 Front page has: "Washington" "The President's Message Vetoing the Southern States Bill" "The Bill Passed Over the Veto by Both Houses" "Continuation of the Debate on the Tax Bill"